There is so much hype now around Ronda Rousey that I sometimes forget what she is – she’s a fighter. The first sentence of her book is simply that: “I am a fighter” and the following chapters are a gripping reveal which will resonate with anyone who’s competed seriously at any sport. I’m still reading so this post is on the childhood and judo sections. It’s so rare to read a book like this by and about a woman, rare and refreshing. So why should you read “My Fight, Your Fight”? 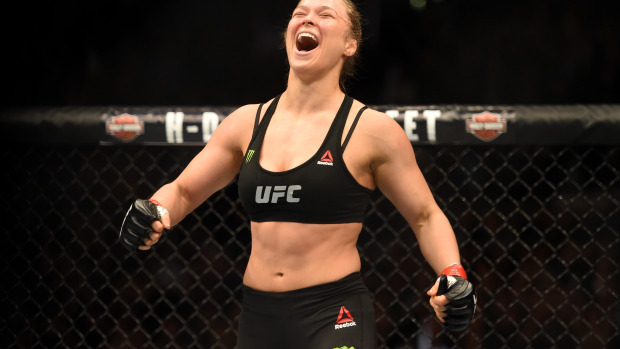 If you’re coping with injuries you will love how Rousey finds strength in every ACL tear or broken bone. And this started even as a child with what could have been a debilitating speech impediment – I’m sure Floyd Mayweather would agree she’s lost that now! If you’re beating yourself up at training, pushing, pushing refusing to laugh in case it makes you less successful – read how Rousey went from being that person in 2004 before the Athens Olympics to someone who loves the highs and lows of training. If you’ve gone days without talking to anyone except your training partners or even alone on the roads, you’ll smile ruefully at Rousey and her soppy movies. And on a more superficial note, I’ve always wondered why Ronda isn’t spelled Rhonda; turns out it was a bit of mistake. Her dad’s name was Ron and he spelled it that way just because.